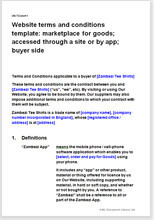 These are terms form a contract with people who use your website or your app to find products for sale. They give you strong legal protection against malicious use of your website and misuse of your intellectual property, and help you to comply with consumer selling law. The document that you create using this template should be placed on your website. It sets out how buyers should use your website or app to manage their product listings and sales (forming an acceptable use policy and contractual terms for the service you offer). You don't need separate T&C for your app provided that you reference your website T&C (those that you use this template to create) at the point of sale and ask your buyers to agree to those terms. Alternatively, you could include the same terms within the app, and keep both versions identical. First it protects you in law from a huge array of potential problems arising from disputes between your merchants and their customers. Second, it enables you to set out how your app and website work to benefit a buyer. It is assumed that you will insist on some standard terms of sale by all merchants so that a buyer can return to your site later and buy from a different one without the terms being markedly different. Third, as far as possible it reduces your obligations imposed by the Consumer Contracts (ICAC) Regulations. We have provided as far as possible for your sellers to be responsible for compliance with the regulations, so as to minimise the weight on you. If your marketplace is business to business only, you can easily remove the provisions relating to the regulations. We provide wide ranging protection of your business, particularly of your intellectual property. This may be more than you need, but can be edited easily by deletion. Is this template suitable for your business? The template contains the necessary provisions for merchants to sell consumers or businesses. You could operate the buyer experience entirely through an app, or through both a website and an app. The nature of the goods is not important to these terms - your business could specialise creating a marketplace for a particular type of good, or allow merchants to sell a wide range. This template is for a business based in the UK. The buyers and the merchants could be located anywhere - you could connect European manufacturers with Australasian buyers, or US buyers with UK merchants. Website T&C are an excellent example of where use of plain English strengthens the legal effect of the contract. If a dispute should arise, it would be hard for a user to claim that he did not understand, even if English is not his first language. This is one of the two sets of T&C that you'll need if you operate a marketplace. This document sets out the terms for your buyers. The other one sets out terms for sellers. The law relating to website T&C is predominantly common law dealing with the basics of contracts. By and large, you have control over the rules you want to set, particularly the commercial ones. The document should be edited so that it reflects exactly how your business works. Our guidance notes will tell you what you can change safely, and what we don't advise changing. We include provisions that allow your sellers to comply with The Sale of Goods Acts (1979 and 1994) and The Consumer Contracts (ICAC) Regulations 2013. The terms include those that deal both with the relationship between the seller and the buyer and with the one between your business and the buyer. We also include over 3,700 words of drafting notes to help you edit the document to suit your website perfectly.